When the Nexus 6P was launched last month, the handset was offered in Aluminum, Graphite, and Frost. A fourth color, Gold, was made available in Japan only. That is, until now. Google has released the Gold colored Special Edition of the stock Android handset in India, priced at the equivalent of $664 USD. The handset has 64GB of internal storage, and is priced about $15 higher than the non-Gold 64GB version of the Nexus 6P. The Gold version of the Nexus 6P will be exclusive to online retailer Flipkart in the country. Sales of the device will begin tomorrow. While the Gold color option is not available for the moment in the U.S., there are rumors that Big Box retailer Best Buy will be offering it sometime in the near future. The Nexus 6P, manufactured by Huawei, features a 5.7-inch AMOLED screen with a resolution of 1440 x 2560 (QHD). This works out to a pixel density of 518 ppi. A Snapdragon 810 SoC is under the hood, with an octa-core 2GHz CPU and the Adreno 430 GPU. 3GB of RAM is inside, and a 128GB capacity microSD slot is available for those who need more storage. On back is a fingerprint scanner, along with a 12.3MP camera featuring an aperture of f/2.0. The 8MP front-facing snapper is ready to take selfies and handle video chats. A 3450mAh battery keeps the lights on, and Android 6.0 is pre-installed. Allen Wang, the president of Huawei India, introduced the Gold Nexus 6P by pointing out that the phone has been "well-received" in India. Now, Indian consumers have the opportunity to pick up this Gold color Special Edition of the Nexus 6P. 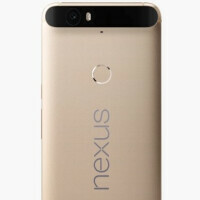 Gold color Special Edition of the Nexus 6P is now available in India"
3GB of RAM is inside, and a 128GB capacity microSD slot is available for those who need more storage.....Really? No thanks. Worst chip of the year. Not to mention the bending issues. Next year should be better. Go buy an iPhone tard. and a 128GB capacity microSD slot is available for those who need more storage.. lol wut? drunk much? ?